Each service is managed for continuous improvement of quality with the primary goal of satisfying our customers. Our priority is to use all the resources necessary to guarantee our customers quality services, aimed at giving a useful and valid technical support to improve their analytical performance, while ensuring confidentiality. 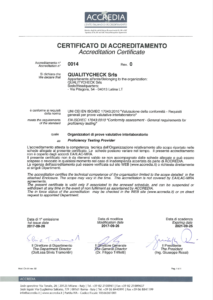 Qualitycheck Srls is accredited as Interlaboratory Proficiency Testing Provider in accordance with standard EN ISO/IEC 17043 Conformity assessment - General requirements for interlaboratory proficiency testing by the Italian Body for Accreditation (ACCREDIA). Download the Accreditation Certificate. ISO/IEC 17025:2017: General requirements for the competence of testing and calibration laboratories. ISO 17034:2016: General requirements for the competence of reference material producers. ISO/TS 22117:2010: Microbiology of food and animal feeding stuffs -- Specific requirements and guidance for proficiency testing by interlaboratory comparison.